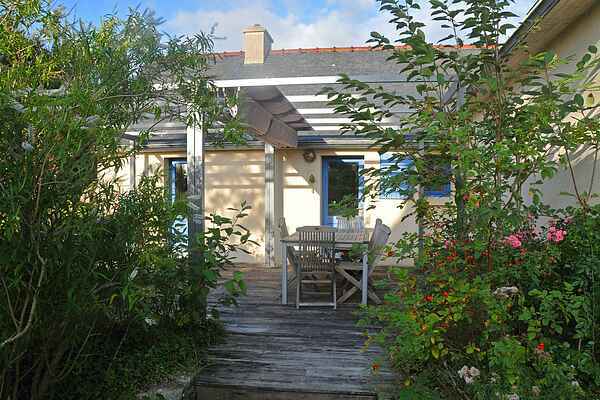 Lovely holiday home on the stunningly beautiful peninsula of Crozon. The house is just at 3.5 km from the sandy beach of Morgat, on the bay of Douarnenez. Modern, detached home surrounded by a large garden. There is more than enough space to kick a ball about and to enjoy yourself on the semi-covered terrace. Get to know the area on foot or by bike. Why not follow the route that starts by the coastal resort of Camaret-sur-Mer (12 km). You will pass many old fortifications that date from prehistory to the modern days. The most famous is the 17th century fort of Vauban. There are a range of lovely views such as Cap de la Chèvre (13 km) or la Pointe des Espagnols (15 km). Don't miss charming Landévennec (19 km), known for its mild climate. Swimming pool, bike and surfboard hire and daily groceries can all be found in Croon (2 km). A couple more tips: picturesque Le Faou (27 km) and Daoulas (40 km). From Le Fret (6 km), take the boat to the lively harbor town of Brest (60 km by car). Here, the children can enjoy the impressive sea aquarium Océanopolis and you can do some shopping.